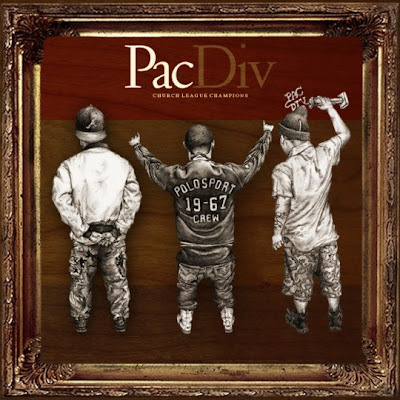 Pacific Division, aka Pac Div, consists of brothers, Like and Mibbs, along with longtime friend BeYoung. The three came together in high school and have been slowly gaining legitimacy underneath the Hip Hop radar. Hailing from north Los Angeles, you could compare their style to a modern day Tribe Called Quest or De La Soul in the way their music has undeniable raw energy and consistent flow to it. If you are familiar with The Cool Kids, their production is very similar in that it is very heavy on bass and features simple, dulled down, old school percussion. They have sort of a throw-back sound that sounds original amidst all of the overly synthesized beats that mainstream Hip Hop has become accustomed to. As a result, like The Cool Kids, their originality will always put them a step ahead of the competition and promise limitless potential in the years to come. You could say their future has started now with the release of the Church League Champions mixtape. 3) How big might they become if they got top shelf production? And that's not to demean the sound they have now, I'm a big fan of them keepin' up with the originality and not following the crowd production wise...but that Khalil beat is disgusting and they went after it bar after bar showcasing why they are so underrated. The highlight of this mixtape for me was their track Knuckleheadz, which sounds like a Mikey Rocks production with the rolling trap laced percussive bounce beat that gives way to a slowed down bass infused beat at the 1:48 mark. Like I alluded to earlier, very organic production, not too over cooked you could say and very very likable due to its originality. Add to that, their track Whiplash with its dark, grimy beat that sticks to you with the catchy "I used to drive a Honda til it ran outta gas, now I'ma push this E til it run outta class" hook. If you're a fan of quality Hip Hop verses I'd encourage you to give Whiplash a listen. Finally, they take it up a notch with the sampling of Duke/Carolina fans with the background imitating their student sections during basketball games. All in all pretty creative and I like how they incorporate a little drumline in there for good measure. Pretty cool how they just jump into the track and hit the ground running on the first verse, setting the tone for a hype track.